J. M. Bumsted, The Red River Rebellion, Winnipeg. Watson & Dwyer, 1996, 359 pp. ISBN 0920486231, $19.95. There has been no lack of books and articles on the 1869 uprising of the Métis that ultimately brought about the entrance of Manitoba into the newly constituted Dominion of Canada. As the author notes, it is a subject that continues to arouse strong feelings to this day, particularly with regard to the role to the role of Louis Riel and the execution of Thomas Scott. Bumsted sets out to steer clear of these hazards, while letting the extensive documentary evidence and narrative of the events, more or less carry the story forward. From the systematic organization of the book and its historiographic review of previous works, it would appear to be written for students of history looking for a good overview of a controversial topic. However, the lack of footnotes and the colloquial tone of the prose indicate that the author may have had more of a popular audience in mind. The book begins with a broad-brush sketch of the background to the uprising and the main groups that were involved. The colony of Red River at the time was a small, isolated community composed of several antagonistic yet inter-twined factions whose interrelationships defy easy classification and explanation. Taking their cue from the documentary evidence, many historians have tried to label, define and explain the division of the Métis community into French and English factions, while downplaying the considerable inter-marriage between the two, and the class differences within both groups. In his overview of the community, Bumsted gives a human face to each group by naming prominent individuals and families, except in the case of French-speaking Métis and Aboriginal people. As the author later demonstrates, individuals from both groups were prominent in Red River so one wonders why they are given so little attention. This may well be an oversight, but it sets an unfortunate tone for the book. Bumsted is weakest when dealing with the role of the French-speaking population of Red River, Métis or Euro-Canadian. Perhaps, if Gerhard Ens’s 1996 work on the Red River Métis had been available, Bumsted could have made use of his analysis of the difference in socio-economic status between Riel’s supporters and opponents among the French Métis. It is sometimes difficult to determine to what extent some of the descriptions of members of the two groups result from the author paraphrasing his original sources. For example he reports that “Nearly 50 braves and a dozen men from the settlement met in McKay’s large dining room. The Natives squatted on the floor, while the settlers sat in chairs ...” (p. 10) Stereotypical descriptions such as this may well have come from his sources, but the way they are presented doesn’t make this clear. 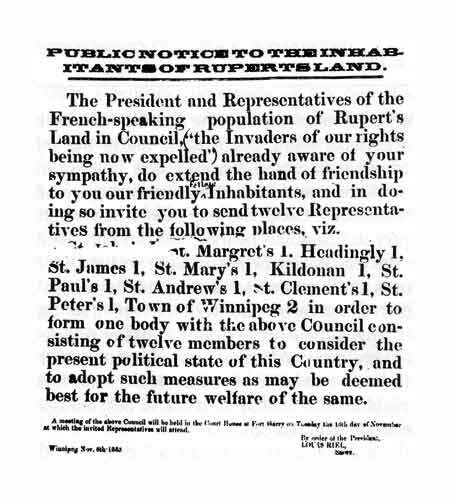 Public notice of 6 November 1869 inviting representatives from Red River’s English-speaking parishes to participate in the Provisional Government. This is not to say that the author only stereotypes certain individuals and groups. Unfortunately, by including numerous little vignettes, and adopting the tone of his sources, the total picture verges, at times, on comic opera or parody, rather than high drama. Yet, from Bumsted’s own comments in the historiographic essay, this is not the final impression that he wished to create. Unfortunately, by downplaying his own voice and letting the often biased sources speak for themselves throughout most of the book, the author unwittingly allows many instances of stereotyping to occur. Bumsted is obviously thoroughly conversant with his sources, and with the major and minor characters involved in the uprising. However, in this work he appears content to write a straight narrative history. I agree with his desire to provide a more balanced picture of the other major protagonists and events rather than simply focusing on Riel. However, by failing to identify any major strands in the web of characters and events which he introduces, the result is a work which is so packed with minor characters and often trivial events, that it is sometimes difficult to distinguish the important from the merely interesting. The result is heavy reading for the novice, while the seasoned reader will be frustrated by the lack of interpretive focus. The Red River Rebellion is a thorough, well-illustrated, and sometimes fascinating account of a pivotal period in the history of Manitoba. Nonetheless, Bumsted’s attempt to marry popular history with an academic text weakens the overall impact of the narrative. Given the author’s mastery of the sources, and his proven ability as a writer in earlier published works, this latest book did not live up to my expectations.